Terms must be set each school year after the first import of data and before the start of the school year. The following steps will guide the user in editing terms. 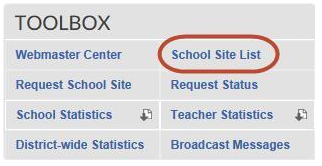 Click School Site List in the Toolbox section. In the District Schools section, click Edit Terms. If you have not used this feature before, you must first add the term labels (e.g. s1, y, fall, etc.) by clicking the blue Add Term button. To add terms, enter the correct label, set the start date for that term and select the subsequent term (e.g. s2 would be the subsequent term for s1). Always use lower case when entering term labels. Hint: Enter the labels in reverse chronological order. For example, if the terms are m1, m2, m3, and m4, start with m4 and work your way back to M1. Choose "End of School Year" for terms that do not have a subsequent term. When you have added all of the terms, click the Update All Schools button to update all schools with the terms you have created. Note: Some schools may have separate term labels and/or dates. In those cases go to the school site's term settings to edit the terms. The image below shows the terms that have been set.